Fof first time in Bulgaria there is a ceremony for E-volution Awards 2013 of Forbes Bulgaria with the help of digital agency E-act. 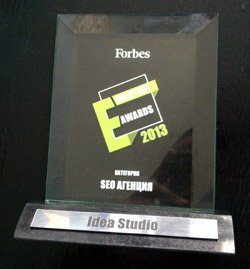 I was very exited and happy to know, that Idea Studio Ltd is choosen to be awarded as a SEO agency. It’s a question of big honor for me and it make me wanna work even more hard! I’d like to thank my colleagues and partners in the SEO branch in Bulgaria. Dragomir Zhelev /delta.bg/ Katya Todorova Metodi Drenovski Lyubomir Rusanov /superhosting.bg/ Alexander Atanasov /jump.bg/.